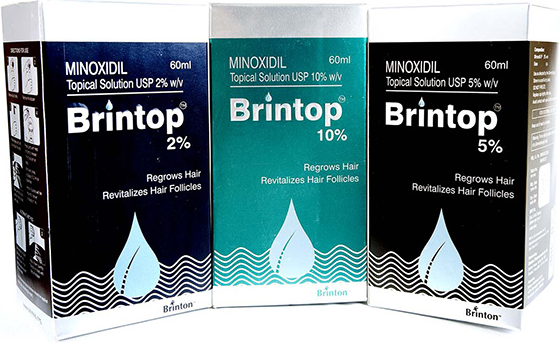 Minoxidil, applied topically used for the hair loss treatment. It is effective in helping promote hair growth in people. Minoxidil in its liquid form is applied directly over the areas of the scalp undergoing hair loss. Originally minoxidil was indicated for the treatment of severe hypertension, and when patients reported slowing of the progression of hair loss and actual growth of new hair the research started for minoxidil use in hair loss. Minoxidil mechanism of action is dilatation of the local blood vessels of scalp and speculated direct activation of hair follicle growth. Minoxidil is available in three concentrations 2%, 5% and 10%. Minoxidil is to be applied at night before going to sleep. Minoxidil can be applied twice daily also but not more than 2 ml should be applied in 24 hrs. Few patients can have burning sensation, eryhtema, palpitations and headache with the use of minoxidil. Once started, Minoxidil has to be used for indefinite period and minoxidil takes 4 months for the results to become apparent. In women, the minoxidil can be used in 2% concentration to prevent further hair loss and occasional hair regrowth can be achieved. Consult your doctor during pregnancy and lactation. Its cause in people with alopecia areata is unclear. Some physicians recommend the use of minoxidil after hair transplantation. Application of minoxidil to the grafted areas once a day can shorten the time interval between the hair restoration procedure and the growth of transplanted hair by around one month. Finasteride is a medication used mainly to treat an enlarged prostate or scalp hair loss in men. Finasteride can also be used to treat excessive hair growth in women. Finasteride (Propecia) on the other hand has more direct action on the hair growth as finasteride is 5-alpha reductase inhibitor and blocks the conversion of testosterone to DHT, the hormone most responsible for hair loss in men. Finasteride works by falling the creation of Dihydrotestosterone (DHT). Finasteride is mainly helpful on the vertex but can decrease hair loss in all areas of the scalp. Finasteride is taken in the dosage of 1 mg once a day orally to prevent further hairloss. Some physicians also prescribe Finasteride is the dosage of 2mg once a day on the alternate days. Post hair transplantation finasteride use potentially increases hair growth over the anterior and middle scalp areas. Finasteride also causes minimizing and even reversing the miniaturization process of hairs in the back of the scalp. Finasteride can also increase the density of transplanted hairs leading to improvement of the surgical results. The most common side effects of finasteride are reduced libido and erection. Finasteride are not very common and are almost totally reversible on cessation of the medication. Multivitamin is a preparation planned to provide as a dietary supplement with various essential vitamins and nutrition elements – with vitamins, dietary minerals, and other nutritional elements. Multivitamins are presented in the form of tablets, capsules, pastilles, powders, liquids, or injectable formulations. Other than injectable formulations, which are only available and administered in medical supervision.